Si La Pública Es Retalla -- JERC jovent independentista. If The Public Is Cut, Battlegrounds! JERC Youth Independence. This sticker shows the figures of a line of men and women with graduation caps on holding hands. Only their outlines are shown. In the lefthand corner a real man is standing holding giant scissors cutting the legs off of the first male in the line. This sticker takes an anti-cuts stance, saying that if there are cuts they will retaliate. 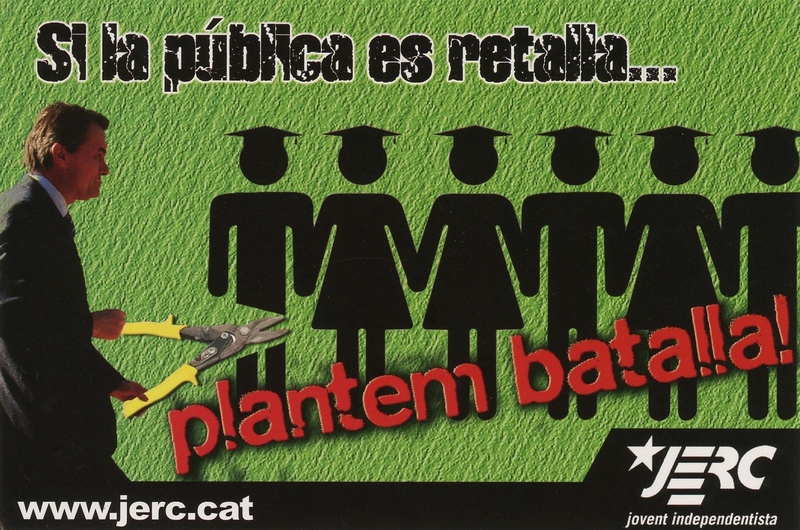 This sticker was part of a campaign to advertise for a student strike on February 8, 2012 fighting for free and quality public education.